-Connecticut. With Chris Shays entering the Senate race probably worth taking a fresh look at one we haven't polled since March. -Kentucky. It's been a while now since there was a new poll on this fall's Governor's race and we haven't polled it for the entirety of 2011. -Missouri. An internal poll yesterday suggested that Peter Kinder's recent issues haven't damaged him any...maybe that's true but it's worth another set of eyes. And also interested to see where Claire McCaskill is right now. -South Carolina. The general assumption is that Rick Perry is the man to beat in the state now but it would be good to actually confirm whether or not that's the case with some polling. -West Virginia. 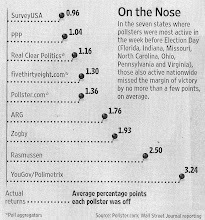 This Governor's race seems likely to be the most competitive in 2011, and it's really creeping up now. Worth checking in on how Joe Manchin's holding up as well. Please don't cheat by voting repeatedly, we had a problem with that on last week's vote. Thanks! A future poll on Minnesota would be interesting. Can Michele Bachmann carry her home state. Conventional wisdom says no. Polling would likely confirm. Kentucky and South Carolina would be nice. I guess you will poll West Virginia anyway before the election in November and Missouri will be polled a lot in 2012, because its a swing state. Connecticut is always polled by Quinnipiac. If you poll KY, can you poll some downballot races like LG and AG? Gov, Lt. Gov, AG, Favorite College Team(s), Rand Paul and/or Mitch McConnell approval ratings. I'd like to see a West Virginia poll, please.